TIME ALWAYS FADES AWAY BUT THE IMPACT YOU MAKE WILL LAST FOREVER. 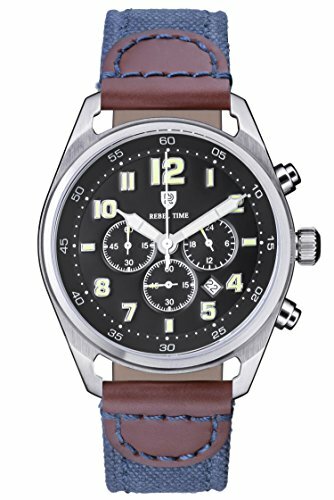 This unique chronograph Pilots watch is made with 316L stainless steel, sapphire crystal, Miyota chronograph quartz movement and a screw down back giving you 330 feet of water resistance. This watch is a modern interpretation of the classic military field watch. Up to date fonts and finishes contrast with classic details to create a perfect mix of military style and fashion. Rebel Time Co. believes that you should own a unique top quality watch that stands out and will last you a generation without breaking the bank. CASE: Brushed 316L Stainless Steel with a Screw Down back and Engraved Crown. This watch will complement any occasion. WATER PROOF: This watch is tested to 100 Meter/330 Feet water resistance, perfect to swim and bathe in cold/warm water. HIGH GRADE SAPPHIRE CRYSTAL: This timepiece comes with a high grade scratch resistant sapphire crystal cover. JAPANESE CHRONOGRAPH MOVEMENT: Japanese Miyota Quartz Chronograph Movement with a 5 year battery life. WE LOVE OUR CUSTOMERS! Buy it risk free and we will do everything in our power to make sure you are completely satisfied. If you have any questions about this product by Rebel Time, contact us by completing and submitting the form below. If you are looking for a specif part number, please include it with your message.